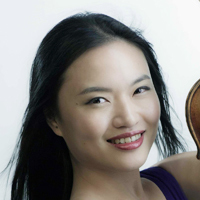 Praised by the Seattle Times as “simply marvelous” and Taiwan’s Liberty Times for “astonishingly capturing the spirit of the music,” violinist Tien-Hsin Cindy Wu enjoys a versatile international career as a soloist, chamber musician, and educator. She has been featured with the National Symphony Orchestra of Taiwan and the Taipei Symphony Orchestra in her native country, as well as such European orchestras as the Odessa Philharmonic Orchestra and the Russian State Symphony Orchestra. As a recitalist and chamber musician, Wu performs regularly in Asia, Europe, and North America at such prominent venues as Carnegie Hall, Alice Tully Hall, Metropolitan Museum of Art, the Kennedy Center, and Library of Congress. Artist with whom she has collaborated include Teddy Abrams, Gary Graffman, Kim Kashkashian, Ani Kavafian, Ida Kavafian, Midori, William Preucil, Thomas Quasthoff, Fred Sherry, Yuja Wang, and members of the Alban Berg, Brentano, Guarneri, Miró, Tokyo, and Ying string quartets. Wu has appeared as guest violist with the Orion String Quartet and the Dover Quartet. She is currently artist-in-residence with the Da Camera Society of Los Angeles since 2013. Wu’s festival collaborations include the Marlboro Music Festival, Santa Fe Chamber Music Festival, Bridgehampton Chamber Music Festival, Mainly Mozart, La Jolla Music Society SummerFest, Music@Menlo, Verbier Festival and Academy, and Olympic Music Festival. She has taught as a chamber music coach at the ENCORE School for Strings, the Hotchkiss Summer Portals, and Wildwood Academy of Music and the Arts. Wu’s media appearances feature performances on NPR’s From the Top, as well as numerous on-air interviews with Philharmonic Radio Taipei and IC Broadcasting of Taiwan. She has been spotlighted on Taiwan’s TVBS Television and in the September 2004 issue of Marie Claire Taiwan. Tien-Hsin Cindy Wu received her bachelor’s degree from the Curtis Institute in 2008. She was a member of the string department faculty at the Thornton School of Music of the University of Southern California from 2010-2015. Among Wu’s many honors and awards are the Gold Medal in the 2003 Stulberg International String Competition and third prize in the Odessa International David Oistrakh Violin Competition. Wu performs on a 1734 Domenico Montagnana violin, and a 1995 Hiroshi Iizuka generously loaned by Arnold Steinhardt.